www.Leonardo-da-Vinci.net is an unofficial website for Italian artist Leonardo da Vinci. Leonardo da Vinci was an influential artist from the Italian Renaissance which spread across several centuries. This website covers the mediums in which this innovative Italian was most involved, such as painting, sketching and invention. Discover details on the main achievements of his life and career, categorised by art medium, with around 50 of his most famous works covered in detail. The most famous Da Vinci paintings would be The Mona Lisa and The Last Supper whilst his sketches of Female Head and Vitruvian Man are also crucial elements within the development of European art since the Middle Ages, with Da Vinci and counterpart Michelangelo being two key contributors in the rise of the Renaissance which led to all the contemporary styles of art that we enjoy today. See also Raphael, Botticelli and Durer for key contributions to the Italian and North European Renaissance movements. Da Vinci paintings feature the extraordinary Mona Lisa which featured Lisa Gioconda from a wealthy family with interests at that time in both Florence and Venice. The ambigious facial expressions in this portrait have left many intrigued by this painting and it's own fame and long surpassed the quality of the work, becoming perhaps the best known and most recognisable oil painting in art history. Leonardo da Vinci became obsessed with this painting like no other in his career, constantly tweaking and amending it for nearly ten years - clearly a sign of it's personal importance to the artist. Leonardo da Vinci's Mona Lisa has been subjected to unparalleled study and research, with many topics included such as Lisa Gioconda and her life plus the technical aspects of the painting itself, plus even some discussion on whether an old painting sits behind this final completed piece. It seems probable that future years will bring more research again, and probably still no definitive conclusions with such a long time having passed since the painting's original inception making most theories impossible to prove. Last Supper is the rest religious scene to have come from Da Vinci, at a time when religious paintings dominated the art market, with so many institutions able to finance large commissions, using only the finest painters in their area of Italy. The Last Supper famously features Jesus Christ at this momentous moment in his life and Christianity religion places great importance on this moment. The original work by Da Vinci has unfortunately been damaged over the years, but considerable work has gone into restoring it to it's former glories and that has now been completed. The Last Supper is popular as a reproduction for those who cannot get the chance to see it in person, with some preferring the original version and others choosing the aged look. Both normally come as framed art prints which gives a professional finish which matches the style of Renaissance art. Posters and stretched canvases also can serve as decent alternatives, too. Books on Da Vinci have also proved highly popular for those studying the different periods of art history. Some new books offer exceptionally detailed reproduction imagery of the original paintings which are actually more helpful than seeing the original for a great distance. Female Head is the best known drawing from Da Vinci, who is also well respected as an artist for his illustrative pencil drawings as well as his grand oil paintings. The sketches served as a set of study pieces for later paintings but reached an impressive level in their own right and many prefer these instead, offering the raw drawing skills of Leonardo for all to see. Many exhibitions have been made of just his drawings alone, with his study of the different parts of the body being something which was of particular interest to him. The different drawings from the career of Da Vinci tend to fit into two different categories, namely styled portraits as found here and also with Bearded Man, and the other type were the plans for inventions that Da Vinci came up with at other times in his career. Many of these imaginary inventions were very low-level sketches that seemed impossible at the time, but many have since gone onto become real products in following centuries. Female Head as seen above is actually his finest of all portrait sketches and remains his most popular art work as a reproduction, which is a considerable achievement when considering the breadth and quality found with in his career. Vitruvian Man is another instantly recognisable drawing which became used in the title scene of BBC TV series, Panorama. It is similarly accurate and detailed as with all of his other articulate pencil drawings and also ranks amongst his most respected pieces of art work. Da Vinci and fellow Renaissance spearhead, Michelangelo, were both exceptionally driven to learn more about the human body and how best to accurately recreate them within their own art. The limbs were particularly difficult to accurately resemble and these were covered again and again by these artists in their study practice pieces. Flying Machine above is an inspired sketch by Leonardo da Vinci and shows off both his skills as an inventor and as a sketcher. It came many centuries before the inception of helicopters and aeroplanes and shows incredible fore-thought, with the genius of Da Vinci many years ahead of the development of man, with everyone else needing some time to catch up. Da Vinci also produced sketches for early stage helicopters, too, and all of these experimental designs are covered in our inventions section. Besides his helicopters and other flying machine sketches, Da Vinci also created ideas for several cannons, catapults and parachutes. These are the best known of his inventions, but his work covered all manner of areas such as Science, Anatomy, Architecture, Sculpture, Botany, Geology, Astronomy, Hydrodynaics, Cartography and Mathematics. Giant Catapult was a series of work from Da Vinci aimed at improving upon existing designs for catapults, which had themselves been around since very early AD. There is no evidence to suggest that the artist's designs were put into practice at the time, but in recent years there have been many enthusiasts who have built replica products based on many of his product design drawings, including the catapult. This design sketch bears an uncanny resembance to an oversized archery bow, placed on the floor to produce the catapult action. St John the Baptist was painted on walnut wood and this portrait is believed to have been the final painting produced by Da Vinci. The original now resides in the Louvre, Paris. Many artists across the centuries since this artwork was produced have created their own versions of it, underlining its influence on the international art scene. Bearded Man was created by Da Vinci in 1512 from red chalk on paper and it is one of his most respected portrait sketches. The original artwork remains in the Biblioteca Reale, Turin, Italy. This self-portrait is the only one known to have been made by Da Vinci during his career, as far as art historians can tell. Such individual pieces are always helpful in learning more about an artist, and specifically how they see themselves. As the only self-portrait for the Renaissance master, it really underlines the importance of this drawing. Drawings are a key medium for the Italian master, and lie at the heart of so much of his work, covering inventive sketches, preparation work for his paintings and also the initial planning for his final pieces. The sketches which remained as just that show off the anatomical skills mastered by Da Vinci and also allow him to display faces in greater detail. The drawing featured here was titled Head of a Woman from 1508. Elements of the artwork have been painted but it remained unfinished and still leaves a large amount of the original sketch to appreciate. Ginevra De'Benci was a portrait completed by artist Da Vinci in 1478, having been worked upon at different times over several years. It is one of several paintings that Leonardo took several attempts to reach a point where he was completely happy with the finished artwork. The subject of the portrait was an aristocrat from around the same time who is believed to have been well known and highly respected around her native Florence. Annunciation is a common theme for many artists during the Renaissance, as one of several key scenes from the teachings of Christianity. Religion at that time was clearly relevant to most aspects of Italian society, and is well represented in art. The world-famous Uffizi gallery of Florence in Italy hosts this oil and temera on panel artwork which also featured contributions from fellow Renaissance painter Andrea del Verrocchio as well. There is a huge amount of detail in this painting and seeing it up close in person is a must for any big follower of this artist's career, as a trip to Florence in general would also have to be. Virgin of the Rocks is often known as Madonna of the Rocks, and are two paintings completed by the artist, one of which resides in the National Gallery in London and the other in The Louvre in Paris. These two works feature nar identical detail, but with different colour balances and serve as interesting, contrasting pieces from which you can learn much about the artist. Mona Lisa makes Da Vinci's reputation able to spread beyond art circles, to become a celebrity of history itself. This painting is known to almost everyone on the planet, and thousands flock to see it in the Louvre in Paris whether they are significant art fans or not. This portrait is the most discussed and mused portrait in art history and also remains one of the most frequently reproduced too, as well as parodied time and time again. Leonardo da Vinci has a long list of drawings and paintings to have come from his considerable career, and we include a short summarised list of the best below. Besides the art works listed above, Leonardo was someone who was far more diverse than almost any human ever, and always managed to enter new fields with a likelyhood to succeed. We include a list below of the major areas in which his career was based. Disclaimer: www.Leonardo-da-Vinci.net is a personal website covering the career of famous Italian Renaissance artist Leonardo da Vinci, but is in no way an official website for Leonardo da Vinci and www.Leonardo-da-Vinci.net does not claim to be that in any way. The Estate of Leonardo da Vinci and their presence hold all necessary copyrights and licences for all of his paintings and other works. 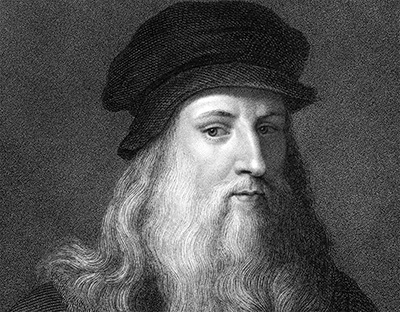 All prints, paintings and photos included in www.Leonardo-da-Vinci.net are provided as an affiliate to Art.com who hold necessary permissions. Art.com pay us small commissions based on any prints or paintings that you buy as a result of using this website.